Lisa Byrne, founder of Italy Perfect, shares her story of Casetta Bonsi, the little house in Florence that gave Italy Perfect its start. I’m so lucky to wake up excited to go to work every day, to share my love of Italy with others and to help guests achieve their dream trip to Italy. We reached a major milestone this month, Italy Perfect is celebrating 15 successful years in business! During that time we have helped over 30,000 travelers enjoy a stay in one of the over 150 vacation rentals properties that we’re proud to represent. We so enjoy hearing from returning guests who first came on their honeymoon, now returning with the family in tow. It gives us pleasure to learn about each client’s reason for visiting Italy, whether it is to celebrate an anniversary, retirement or graduation, or to reconnect with long lost Italian relatives, the desire to indulge in Italian hospitality, culture and food is a given. Thank you all for your business and for the wonderful referrals of friends and family. For the many of you who have asked how we got into this business, here is how it all started. A summer vacation to Italy in 2003 completely changed my career path. I worked in Silicon Valley in high tech marketing and public relations for nearly 20 years, leaving Apple Computer to start my own public relations consulting practice in 1997. I was nervous about leaving the corporate world, wondering if I could make a living as an independent consultant. Fortunately, I caught the early days of internet boom, my PR consulting practice was thriving, so starting a vacation rental business wasn’t top of mind, even though my sister Madelyn Byrne had started Paris Perfect and London Perfect four years earlier. Madelyn and I had vacationed in Rome with our husbands the previous winter and realized how much we missed Italy; we’d lived in Italy in our youth when our father, an American expat, worked in Rome and Naples for many years. In fact, I was born in Italy — Rome is like a second home to me. 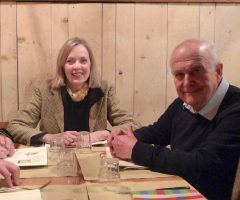 Madelyn and I brainstormed the idea of me expanding the Paris Perfect and London Perfect vacation rental business into Italy. With a good base of knowledge about the country, the culture, the language and personal connections in Italy, it was a natural fit. We returned to Italy the summer of 2003, arranging a stay at a vacation rental house in Florence owned by a friend of sister Pat’s college roommate who worked with Madelyn as a buyer for Macy’s department store. The acquaintance was a Florentine who had worked in Macy’s Florence buying office when Macy’s still sourced luxury goods such as silk scarves and neck ties, gold jewelry and leather goods from Florence. A sidebar to this story that I’ll never forget is that the summer of 2003 was one of the hottest on record . Prior to going to Florence we had booked a stay at a villa on Lake Como where we practically melted from the intense heat. There was one electric fan that all of us crowded around to try to get some air! On a scorching August day in 2003 we arrived in Florence to meet Maurizio, the owner of Casetta Bonsi. We settled in for several days and were immediately enchanted by the small picturesque house on a quaint street right in the center of the city. Although I had been to Florence many times, I got to know the Oltrarno neighborhood really well, getting up early each morning before the heat of the day to explore the back streets, walk the hills and dash down to the bakery for fresh bread before the family was up. In the evening we’d enjoy a glass of wine on the terrace at sunset and listen to the church bells toll. I learned that Maurizio had inherited Casetta Bonsi from his grandfather, a very successful English tailor, who came to Florence at the turn of the century to make fine garments for English tourists who came for “the season”. If you’ve read or seen Room With a View, think Lucy Honeychurch and her aunt Charlotte. I could see the great care and attention to detail that Maurizio and his lovely wife had bestowed on Casetta. To this day their pride of ownership is evident with the pristine condition and cleanliness, as well as the warm welcome each guest receives. Maurizio told me he could use some help to market his property, as bookings were scarce. I went to work, adding decorative touches and taking photos. My family pitched in to help, despite the oppressive heat the engulfed Florence, we thoroughly enjoyed our stay and the opportunity to experience Florence like locals. On returning to California, my husband helped me build a rudimentary website. It was early days for the online vacation rental business, marketing was largely through print publications and word-of-mouth. 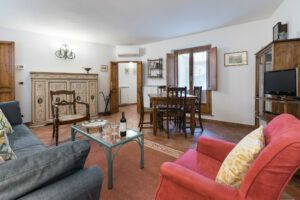 Most clients had never stayed in a vacation rental before, and especially not in Italy. It was with pleasure that I started getting a steady stream of bookings and began to grow the business, adding more properties that I learned of through Maurizio and other Italian friends, going to Italy several times a years to meet owners and look at potential properties. Maurizio and I became fast friends, we both have a strong work ethic and a desire to have happy guests. 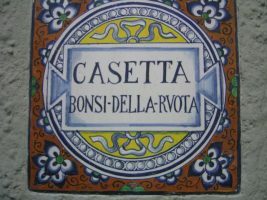 Casetta Bonsi boasts 15 years of terrific reviews from hundreds of satisfied guests. I fondly refer to Maurizio as my “Fratello Maurizio”, my brother. Coming from a family of six sisters, it is high praise to be the honorary brother to the six Byrne girls! Little by little the business grew. I kept going full time on PR consulting, working nights and weekends on the vacation rental business. By 2008 the vacation rental business achieved enough momentum that I stopped PR consulting and persuaded my sister Pat to join forces with me at Italy Perfect. As much as I loved the trips to Italy to view new properties, it was a lot more fun to have her along instead of traveling solo. Pat and I have complimentary strengths, having built a wonderful partnership over the years, made stronger by the bonds of sisterhood. To think I owe it all to a hot August day 15 years ago at a little house in Florence. 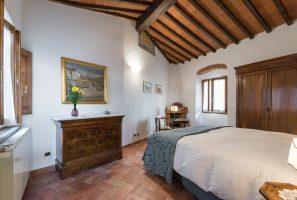 I invite you to book a stay at Casetta Bonsi where you can enjoy a charming house with a little terrace in a prime Florence location and the warm hospitality of my Fratello Maurizio! Love the story, love Cassetta Bonsi! God Bless!